Kota Kinabalu: Some 799 passengers travelling to Zamboanga from Sandakan on the MV Danica Joy 2 can count their lucky stars that the vessel capsized just after the last passenger got off the vessel at the port there on Thursday night. The incident also means that thousands of Filipinos intending to return home would be stranded in Sabah for quite some time or until the operator, Philippine-based Alezon Shipping Lines, puts an alternative vessel on the route. Eleven Malaysians and an Australian were among the passengers in the vessel when it sank while unloading cargo. However, they were all safe. 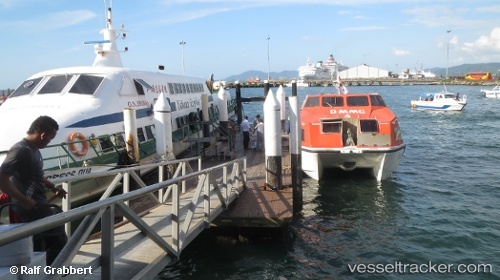 The vessel had just arrived from Sandakan when the incident happened. The Danica Joy 2 departed Sandakan Port Wednesday night and arrived in Zamboanga City at 8pm Thursday. Star Cruises East Malaysia Operations vice-president Edward Johann Leong said throughout this five-month period, the 51,309-tonne ocean cruise liner would be calling at Bandar Seri Begawan (in Brunei) and Bintulu on a weekly basis, said in the company's press release. Star Cruises will be the first international cruise line to be homeported in Kota Kinabalu, thus continuing its pioneering and leading position in Asia’s cruise industry. “It didn’t take us long to decide on making trips to Brunei and Bintulu as Sarawak and Sabah have everything to offer in multitude of ways, such as the food and cultural experience.” “Sabahans and Sarawakians are well-known also for their hospitality and sincerity,” Leong told a press conference at the Tourism Ministry office here yesterday. Also present were Tourism Ministry permanent secretary Datu Ik Pahon Joyik, Sarawak Tourism Board (STB) chief executive officer Datuk Rashid Khan and Bintulu Resident Muhamad Yakup Kari. SuperStar Aquarius, belonging to Star Cruises, is currently homeported in Keelung, Taiwan. It will embark on a special maiden journey (8D7N) cruise from Kaoshiung on Oct 29, with stops at Hong Kong, Manila and Boracay of the Philippines.